Do States Really Want To Be Like Colorado? The Marijuana Industry is making a mad dash to legalize recreational marijuana in all States. Why? There’s huge money to be made! Not unlike the Big Tobacco battle of the 1970’s, the marijuana industry sees their fight to make weed legal as Big Tobacco 2.0. With a similar strategy as 50 years ago, the same mentality of “get them hooked young and you have a customer for life” is not even an undertone. It’s their goal, their platform. And while states like Colorado, Oregon, Washington, and California are living the experiment, there’s the dark side the industry certainly does not want anyone to see. If they can simply convince the average voter that the State can make a bunch of money by taxing a “regulated” industry and normalize the use of cannabis among our youth, they have a pretty darn good shot at passing a law that is voter protected. Arizona dodged a bullet during the November 2016 election, but we’ll see it again, as other states are faced with lawmakers continue to “buy in” to the lies stated by the marijuana industry. Legalizing marijuana increases use among youth. It increases use across the board. 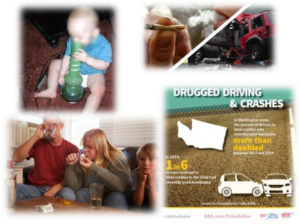 It is addictive and causes harm to families, schools, law enforcement, businesses, communities, the environment, etc. Crime increases, community costs increases, homelessness increases….But you don’t have to take my word for it. In fact, don’t! See for yourself how States that have legalized weed are shaping up. The quiet crisis that the marijuana industry does not want you to know. DrugFree Idaho, Inc. shares their findings of how marijuana normalization impacts communities. Do you really want your state to look like Colorado? Watch Chronic State by clicking on the large title. And if you care, please share among your community of family and friends.